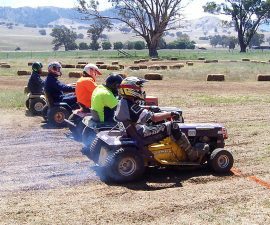 Although there are many different types of lawn mowers, the vast majority of them share a common engine system, which is known as a 4 cylinder engine. The following explanation strives to explain the internal process of this type of engine, and as such, how a lawn mower works. 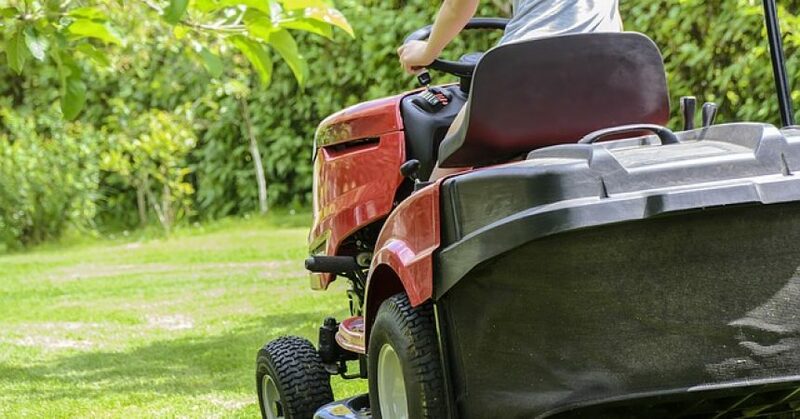 To start the engine of a lawn mower, one must simultaneously hold the brake bar, which can be found parallel to the handle, and pull the starter cord. The starter cord will start the fly wheel to spinning, which in turn starts the crankshaft moving. The crankshaft is connected to the single piston in the engine, and so by pulling the starter cord, many of the vital pieces of the engine are set into motion. Another important part of the engine is the spark plug, which is designed to light the gas in the engine and cause combustion. The spark plug is powered by two magnets, which are attached to the fly wheel. As the fly wheel spins it carries the magnets past the ignition coil with every rotation. This causes a magnetic field, which is used to power the spark plug. While that is going on outside of the cylinder, inside it the piston is completing its four stroke process, the first of which is the Intake Stroke. As the piston moves to the bottom of the cylinder and the intake valve releases, a mixture of gas and air is allowed to flow into the carburetor. Then the piston rebounds back to the top of the cylinder. The intake valve has closed by this time, and so the mixture of gas and air is trapped and gets compressed into a tiny space. This is the second stroke of the process, the Compression Stroke. It is at this point that the sparkplug fires, using the electricity generated by the magnets rotating past the ignition coil, and the spark combusts the compressed mixture of gas and air. The resulting explosion, although small, is sufficient to push the piston back to the bottom of the cylinder, completing the third stroke, the Power Stroke. The final stroke of the four stroke process, the Exhaust Stroke, takes place when the piston, using the momentum of the spinning fly wheel, moves back to the top of the cylinder. At the same time the exhaust valve opens, allowing the exhaust left over after the combustion of the gas and air mixture to exit the system through the muffler, completing one cycle of the necessary four step process. As the piston rotates back and forth, it is stabilized by the crankshaft. 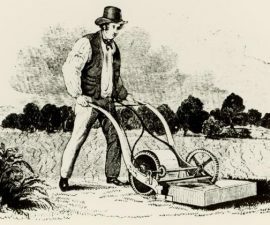 The blades of the mower, which actually cut the grass, are also connected to the crankshaft, so as it spins, keeping the piston steady, the blades spin as well, underneath the machine, and the grass gets cut. The engine will continue going through these steps until the brake is applied and the process is interrupted and the engine stopped. When the operator releases the brake bar, it causes a grounding circuit it be closed, which in turn applies a brake pad to the fly wheel, stopping the chain reaction which is causing the engine to run. 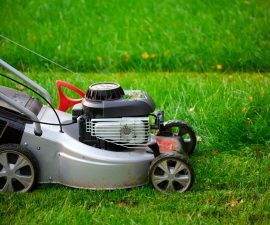 The 4 cycle engine is a simple yet elegant process that relies on a few pieces working in tandem to not only keep itself running, but to also turn the blades of the lawn mower and cut the grass as desired. I like your details of how a lawn mower works. I have a briggs n stratton engine, relatively new, and doesn’t start. Carb ok, firing ok…so now I am looking for reasons why it doesn’t start, or how it works. I am not a mechanic but would like ti understand the process and what/why to check.